How Do You Become an Armed Services Chaplain? If you have received the calling to join a faith-based career while serving your country, then you may want to become an armed services chaplain to provide religious services for members of the military. As qualified clergy and commissioned military officers from diverse religious backgrounds, armed services chaplains are considered the most trusted confidants among all members of the military by providing moral and spiritual support in a confidential relationship. Whether serving on a large military base stateside or within a makeshift tent in the desert of the Middle East, chaplains stand shoulder to shoulder with soldiers to offer essential spiritual guidance. Since not everyone is fit for the duty of ministering in a global environment, the following is an overview of what it takes to become an armed services chaplain. As with other soldiers enlisting in the military, there is a set of basic requirements for armed services chaplains to meet before they can be considered for active duty, according to the Army. Whether choosing to serve in the Army, Marines, Navy, Air Force, National Guard, or Army Reserve, it is required that chaplains have U.S. citizenship. While all chaplains must be at least 21 years old, they must be younger than 42 for the armed forces or less than 45 for the Army Reserve. In order to qualify, you must also receive National Agency Security Clearance and have the ability to pass a physical exam at one of the Military Entrance Processing Stations (MEPS) while being within the height and weight standards. Like other institutions, the Armed Forces will not view you as a suitable potential chaplain until you have earned a post-baccalaureate degree. In most cases, you will need to have a bachelor’s degree with no fewer than 120 hours from an accredited institution. Though no chosen major is required, many decide to pursue a degree in religious studies, Biblical studies, theology, psychology, ministry, or counseling. Then, you will be required to complete no less than 72 semester hours at an accredited institution within a qualifying graduate degree program. You may choose to pursue a Master of Divinity (M.Div. ), Master of Ministry (MIM), Doctor of Ministry (D.Min. ), or Doctor of Divinity (D.D.). For becoming an armed services chaplain, it is typically required that you have a minimum of two years of full-time professional experience in ministry. Also, before enlisting as a chaplain, you will need to provide proof of an ecclesiastical endorsement from your religious and/or faith group. 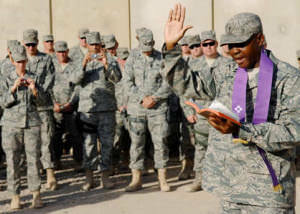 Since the military needs to ensure you are qualified spiritually, emotionally, intellectually, and morally to serve as a chaplain, the endorsement will need to specifically state that you are a recognized member of the clergy in your religious denomination. Due to the fact that the military is filled with servicemen and women of diverse faiths, the endorsement should attest that you are sensitive to religious pluralism and have the ability to support the practices of all personnel. In fulfilling a wide range of roles and responsibilities, armed service chaplains serve in the military as preachers, teachers, guidance counselors, confidants, friends, and citizen-soldiers to support those who serve. When you meet these requirements to become an armed services chaplain, you will receive the unique opportunity to utilize your ministry leadership experience to accompany soldiers all over the world and enhance their spiritual readiness as they carry out their missions.